As revealed this morning at the Diamond Retailer Summit in Baltimore, MD, Valiant is proud to announce that the widely acclaimed BOOK OF DEATH event storyline has sold more than 200,000 copies and counting as of September 2015, cementing its status as the most successful crossover event of the decade from an independent publisher. 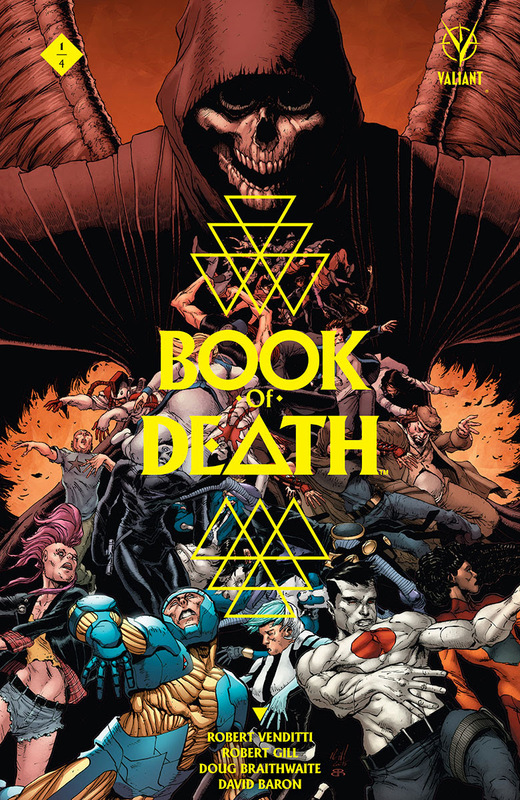 Following a record-setting debut of more than 70,000 copies for BOOK OF DEATH #1 (of 4) in July, Valiant’s blockbuster summer event – helmed by New York York Times best-selling writer Robert Venditti (X-O MANOWAR, Green Lantern) and artists Robert Gill (Batgirl) and Doug Braithwaite (ARMOR HUNTERS) – has continued to accrue widespread critical acclaim and multiple distributor sell-outs across both the core BOOK OF DEATH limited series and four standalone one-shots from an all-star cast of preeminent creative talents, that inlcudes writers Jeff Lemire (BLOODSHOT REBORN, Descender), Matt Kindt (NINJAK, Mind MGMT), Joshua Dysart (HARBINGER, Unknown Soldier), alongside artists Trevor Hairsine (DIVINITY), Kano (QUANTUM AND WOODY), and Clayton Henry (ARCHER & ARMSTRONG). Spanning eight issues total, BOOK OF DEATH collides the next thousand years of history with the most powerful heroes of today. X-O Manowar. Bloodshot. Ninjak. The Harbinger Renegades. Unity. This is how they lived. This is how they died. Now we know. The Book of the Geomancer has recorded it all. But only a young girl – the last in a line of the enigmatic mystics who protect the Earth known as Geomancers – has seen this future come to pass, from the coming cataclysm to the dawn of the 41st century. Alone with her sworn protector, the Eternal Warrior – a soldier battle-forged across five thousand years of combat – the duo must defy their allies to stop the Dark Age that now threatens to eclipse our world. On November 18th, step out of BOOK OF DEATH and into the farthest reaches of the Valiant Universe, only in WRATH OF THE ETERNAL WARRIOR #1! Also announced at today’s Diamond Retailer Summit, the complete BOOK OF DEATH epic will be collected between two trade paperbacks in January 2016, beginning with the BOOK OF DEATH TPB – re-presenting BOOK OF DEATH #1-4 (of 4) with never-before-seen bonus materials from series artists Robert Gill and Doug Braithwaite. Shortly thereafter, also in January 2016, the publisher will debut a second volume – BOOK OF DEATH: THE FALL OF THE VALIANT UNIVERSE TPB – collecting the four acclaimed one-shot chapters detailing the apocalyptic future that awaits Valiant’s biggest heroes from BOOK OF DEATH: THE FALL OF BLOODSHOT #1, BOOK OF DEATH: THE FALL OF NINJAK #1, BOOK OF DEATH: THE FALL OF HARBINGER #1, and BOOK OF DEATH: THE FALL OF X-O MANOWAR #1. For more information, visit Facebook, Twitter, Tumblr, and at ValiantUniverse.com.